Learn the Computer navigated Hemi-pelvectomy for Ewings sarcoma surgical technique with step by step instructions on OrthOracle. Our e-learning platform contains high resolution images and a certified CME of the Computer navigated Hemi-pelvectomy for Ewings sarcoma surgical procedure. Malignant bone tumours account for only 4% to 6% of all cancers in children under 14 years of age. Although these tumours can arise anywhere in the skeleton, tumours arising from the pelvis are rare. The principle tumour types arising from the pelvis in those under 16 years of age are osteosarcoma and Ewing’s sarcoma, with the remainder constituting rare histologic subtypes. Ewing’s sarcoma is composed of primitive, undifferentiated, small round blue cells with large nuclei and scant cytoplasm that bears no resemblance to normal tissue. The characteristic translocation between chromosomes 11 and 22 results in a fusion gene, EWSR1-FL11, which is present in 90% of cases. Other translocations have been discovered, most frequently t(21:22). Pre-operative chemotherapy frequently results in extensive tumour necrosis and shrinkage. Wide excision is often combined with radiotherapy to improve disease free survival. Definitive radiotherapy rather than surgical excision, although associated with worse overall survival, may be advocated if non-resectable or metastasis has occurred during chemotherapy, to spare the surgical morbidity. Computer navigation surgery allows linking between the patient’s imaging information and anatomy through the use of tracking and registration of the preoperative and/or intraoperative acquired images. The use of computer navigation for tumour resections has found favour for resection of pelvic lesions. 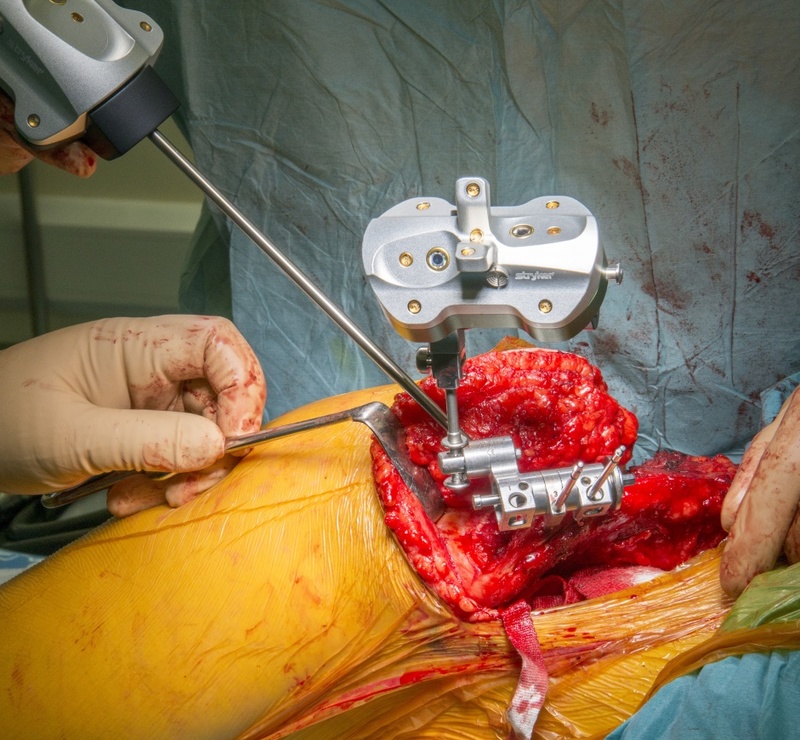 Navigation allows accurate pre operative planning of resections with accurate placement of planned osteotomies to allow adequate margins to be achieved without compromising vital structures.